In addition to (or sometimes instead of) holding a monthly Esbat rite, some Wiccan and Pagan groups prefer to have a season-specific full moon ceremony. 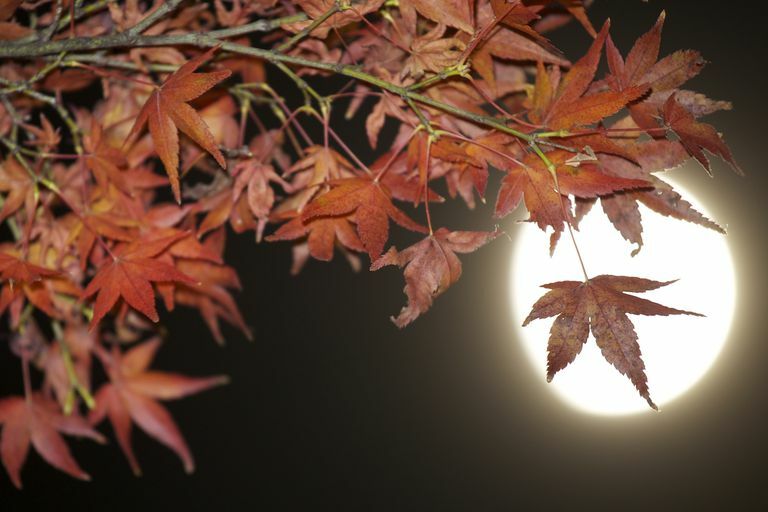 The traditional autumn season includes September's Harvest Moon and the Blood Moon of October, and wraps up with the Mourning Moon of November. If you'd like to celebrate one or more of these moon phases with a ritual specific to the harvest, it's not hard. This rite is written for a group of four people or more, but if you needed to, you could easily adapt it for a solitary practitioner. You'll want to include quarter candles*, as well as a cup of wine or cider. If you're including Cakes and Ale as part of your celebration, place your cakes on the altar as well. Assign a member of the group to call each quarter. Each person should stand at their assigned quarter holding their unlit candle (and a lighter or matches), and facing the altar. If there are more than four of you present, form a circle. Some traditions choose to begin rites facing east, while others prefer the north. This ritual begins with the calling of the north quarter, but you can adjust or adapt it based on the needs of your own tradition. in this time of harvest. Place the candle on the altar. in this season of abundance and bounty. illuminate our way through the coming winter. and prepare us for the chill that is to come. to celebrate the season, and rejoice. As the moon above, so the earth below. Go around the circle, passing the wine or cider. As each person takes a sip, they should share one thing they are looking forward to in the coming month. Do you hope to manifest financial independence? Develop your intuitive powers? Or are you perhaps hoping to grow your relationships? Now is the time to state your intent. Take a moment to reflect on the bounty of the season. When everyone is ready, either move on to your next ceremony, such as Cakes and Ale, Drawing Down the Moon, healing rites, etc., or simply end the ritual. Quarter candles are colored candles based on the colors of the four cardinal directions: green for north, yellow for east, red to the south and blue in the west.